Seed to Sausage cured meats: handcrafted and so tasty! Michael McKenzie of Seed to Sausage in Sharbot Lake, Ontario. Photo: Ottawa Citizen. Canadian handcrafted cured meats that are among the best in the world, that’s the mission at Seed to Sausage, says Michael McKenzie, the young man who grew the business from making sausages for family and friends in his garage in Kingston, Ontario. Based in Sharbot Lake between Kingston and Ottawa, Mike, now 38, also has a busy retail shop in Ottawa at Gladstone and Bronson and he’s opening a butcher/sandwich-maker at the Kanata Centrum. Many people know Mike because of Day of the Pig, the popular family event he hosts every year. This Sunday, May 21, Day of the Pig will be celebrated at Sharbot Lake Beach with a huge BBQ. Every year since 2011, Seed to Sausage has been a mainstay at The Great Canadian Cheese Festival where McKenzie’s cured meats will be available for sampling and purchase on June 3-4. 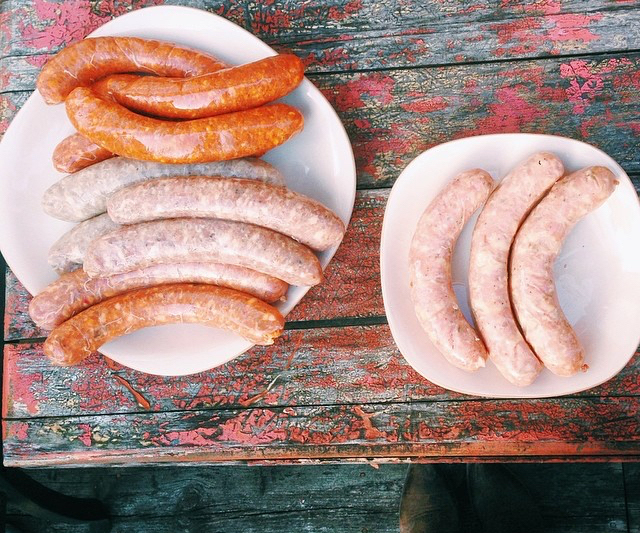 Seed to Sausage brings a commitment to ethically raised animals and a dedication to making things its own, sourcing products right back to the seed they began with. Beyond that, the Seed to Sausage brand has also become an ambassador for Ontario’s artisan producers, offering venues for smaller businesses to begin sharing their products with urban markets. Here’s an idea for the grill from Seed to Sausage: Jalapeño cheese curd smokies. Photo: Laura Voskamp. Over its eight-year history, Seed to Sausage quickly gained recognition, to the point where it’s now hard to believe we’ve ever sourced our bacon from anywhere else. The principles of “local. ethical. humble.” craft are at the core of the Seed to Sausage brand, where everything is handmade in small batches. From sausages (don’t miss the Maple Walnut variety) to bacon (all varieties are made using real hickory smoke) to dry cured meats (McKenzie’s cuts are dry aged for 80 days), the S2S roster is extensive. Minimal added ingredients mean that the flavours of the meat shine through in McKenzie’s products, injecting a distinctly Canadian profile into traditional European styles. 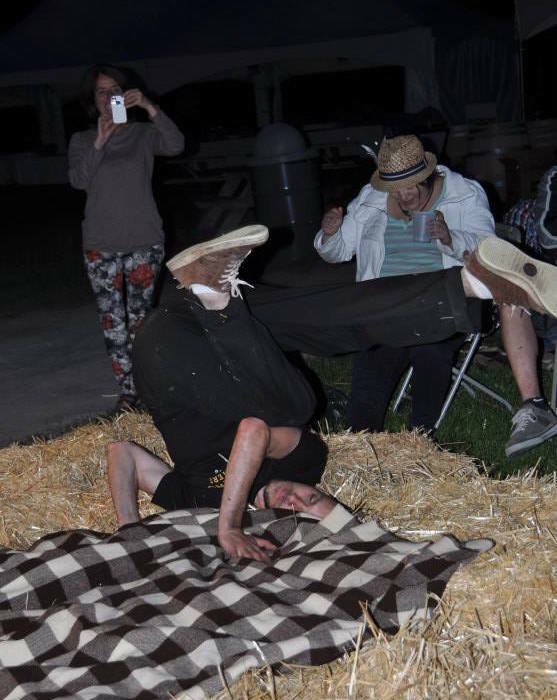 Unauthorized photo of Mike McKenzie break dancing in the straw at a Cheese Festival after-party. Photo: Vanessa Simmons. Beyond its own products, Seed to Sausage also boasts a gourmet grocery store, stocked with all manner of accoutrements to help you enjoy your salumi to the max. You’ll find crackers, salts, and preserves, all selected with the meats in mind. This offering spills over into Seed to Sausage’s outpost: The S2S General Store, located on Gladstone Avenue in Ottawa. Born as a collaboration between multiple facets of Ottawa’s food scene, McKenzie has created a space where chefs, bloggers, and producers can come together to create a distribution point for small producers. The aim isn’t to be exclusive though: the S2S General Store wants its shoppers to love the products so much that they begin to ask for them at their local stores, opening up the scene for local producers to gain their own following. McKenzie offers much credit for his success to Ken McKenzie, his father: “He’s the reason why I’m still in business.” In charge of production is Derek McGregor, formerly long-time chef at Le Chien Noir Bistro in Kingston. Meet Mike and Derek and the rest of the S2S crew at the seventh anniversary Great Canadian Cheese Festival—the biggest artisan cheese and specialty foods show in Canada—taking place Saturday and Sunday, June 3 and 4, in Prince Edward County, at the Picton Fairgrounds. For complete information and tickets, please visit CheeseFestival.ca. —This post is an updated version of a profile written in 2015 by Laura Voskamp, a cheese lover and freelance writer. Jenna Empey with Gut Shot, an innovative digestive aid packed with probiotics. Jenna Empey and Alex Currie make a fitting partnership both in business and in life: they started a band mere days after they began dating and eventually ran a record label together. In 2012, they launched a new business venture when they founded Pyramid Ferments in Prince Edward County, producing handcrafted fermented food and beverages using local ingredients sourced from County farmers. Jenna has always been passionate about working in the food and agriculture industry. She began working with local farms in the County in 2003, but took a break to move to Nova Scotia for a few years on a whim. Relocating to the city made her miss that connection to the local food scene and so she began experimenting at home with new kitchen techniques to retain a relationship with food. That’s where she discovered her love of fermenting. It was in Nova Scotia that Jenna began selling her fermented products, beginning with local farmers’ markets and a specialty food store. Jenna and Alex began growing their own food and making ferments to sell on a farm in Prince Edward County five years ago. In 2012, Jenna, 33, moved home to Prince Edward County and Alex, 34, joined her. They settled on a farm and began growing all their own food and making ferments to sell, launching Pyramid Ferments. The early days of the business were challenging, as they lived in an unheated trailer and spent their days farming the land and building up the business. Pyramid Ferments began with a variety of saurkrauts and kimchi and expanded to include kombucha shortly after. Jenna and Alex split the work; she focuses on the vegetable ferments, while he oversees the kombucha operation. Pyramid Ferments has grown rapidly and their line of tasty and gut-healthy products has expanded. They developed Gut Shot, an innovative, potent digestive aid packed with probiotics; Beet Kvass, a traditional Eastern European probiotic drink; and a small-batch series of products that draws from what’s in season on the farm and what they can harvest through foraging. Pyramid Ferments has earned a devoted customer base and widespread recognition for its devotion to revitalizing the fermented food movement. The company has been honoured with two Premier’s Awards for Agri-Food Innovation Excellence. For Jenna, the most rewarding part of running her business is to be back in the Prince Edward County community, working alongside a supportive local food community. “We love our lifestyle here. We work really hard and we’ve grown this business in a community that we love and that is very supportive. It’s great to live in such a nice, warm, welcoming place and to be able to grow our family and our business here,” Jenna said. But running Pyramid Ferments hasn’t been without its challenges. As innovators in the fermented food space, Jenna and Alex have had to adapt and invent their business model as they go. They’ve learned important lessons in their first five years of business and are proud of the success they’ve earned. Pyramid Ferments brings its line of tasty and gut-healthy products to The Great Canadian Cheese Festival on June 3-4. Pyramid Ferments will bring its full range of handcrafted fermented products to The Great Canadian Cheese Festival at Picton’s Crystal Palace on June 3-4. They’re also planning to bring some prepared foods, like tangy, spicy kimchi rice. This will be their third year taking part in the Festival and Jenna is looking forward to meeting with like-minded artisan producers from across the country. This year, Jenna is also busy planning the first Ontario Fermentation Festival, taking place in the County in August. She and the vendors are eager to showcase the full range of fermented goods, like pickles, miso, beer, sourdough bread, chocolate and coffee. —Phoebe Powell, senior roving reporter at CheeseLover.ca, is a freelance writer based in Toronto. Her last blog post was on Kennedy boys to serve their father’s famed braised-beef poutine at #TGCCF. Chef Jamie Kennedy elevates poutine to a fine-dining experience. When your father is one of Canada’s most renowned chefs, a passion for food and an appreciation for the restaurant industry come naturally. Nile and Jackson Kennedy grew up around the celebrated kitchens of their father, chef Jamie Kennedy, Canada’s first celebrity chef and a pioneer of the local food movement. But being the chef’s sons earned them no special treatment, as they worked their way through various positions within Kennedy’s restaurants. Nile got his start in the family business at age 17, working in coat check during private events at the Gardiner Museum, where Jamie Kennedy then ran the venue’s fine dining restaurant and catered on-site weddings and other special events. From there, Nile worked his way up to become an event server at the Gardiner and then an a la carte server at Kennedy’s Gilead Café, the chef’s last Toronto restaurant, which closed its doors in 2015. Nile and Jackson Kennedy will serve J.K. Fries in addition to braised-beef poutine at #TGCCF. Working in his father’s restaurants taught Nile a great deal about the industry and allowed him to spend plenty of quality time with his dad outside the house. For the past two summers, Nile and his brother Jackson, 26, have operated J.K. Fries, a mobile French fry kitchen they run at events and farmers’ markets around Toronto. J.K. Fries offers Chef Kennedy’s signature double-fried French fries, made with local Yukon Gold potatoes, fresh thyme and sea salt. The fries are always made entirely on site, for the freshest, crispiest snack possible. This summer, J.K. Fries is setting up shop in Prince Edward County, offering its famous fries at events in the region all season long. For Nile and Jackson, this means a break from city life, and a chance to slow down and take a well-deserved break at the Kennedy farm in the County. Chef Jamie Kennedy works his magic in the converted barn on his farm in Prince Edward County. The brothers are looking to discover new interests outside the restaurant business, including learning to craft handmade utility knives using wood and metal found around the family farm. With the help of YouTube, they plan to teach themselves to build a forge and try their hands at knife making during their down time. The Kennedy brothers will bring a special version of the J.K. Fries stand to The Great Canadian Cheese Festival on June 3-4, with a braised-beef poutine, an artful take on the iconic, indulgent dish that his father made famous when he became the first Canadian chef to introduce poutine on a fine-dining menu. The Kennedy boys will be serving up the braised-beef poutine and the fries at the Festival’s Artisan Food Court on both Saturday and Sunday from 10am to 4pm. Meanwhile, Jamie Kennedy is hosting a fabulous feast at his Prince Edward County Farm on Saturday evening as part of his popular Summer Dinner Series. Award-winning cheesemakers Jean Morin and Marie-Chantal Houde will be among the lucky 55 guests—with their fromage featured on the cheese plate. Jackson Kennedy tosses double-fried French fries, made with local Yukon Gold potatoes, fresh thyme and sea salt. When he’s not slinging their much-loved poutine dishes to hungry festival-goers, Nile is eager to explore what’s new at this year’s Festival. He’s attended the past few years both to work and to observe. “What’s great about the Cheese Festival, especially with all these local producers coming, people can taste all these amazing cheeses and it gives them ideas about what’s possible,” Nile said. —Phoebe Powell, senior roving reporter at CheeseLover.ca, is a freelance writer based in Toronto. Her last blog post was on La Moutonnière: Happy sheep make award-winning cheese. Chef Derek MacGregor (left) has joined Mike McKenzie at Seed to Sausage. 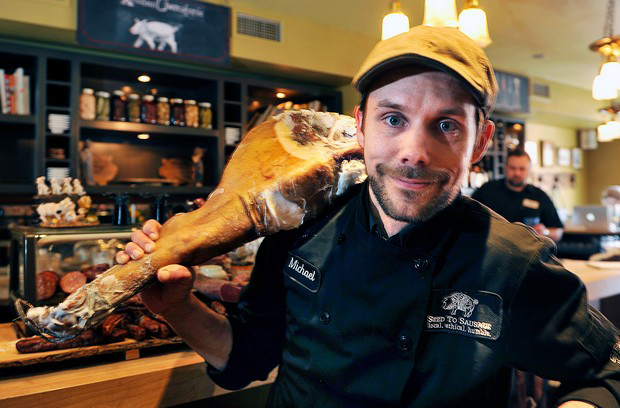 The name Derek MacGregor is quite synonymous to the local food scene in Ontario. His food philosophy is all about simplicity and fresh quality ingredients, especially Canadian cheese. The concept of farm to table is true to his heart, having grown up in a small community near Cornwall surrounded by fresh foods and grandmas who were exceptional cooks in the kitchen. He is a firm believer of embracing the local food community and has created great rapport with many of the farmers, cheesemakers and artisans. Chef Derek states that shopping local supports our local economy and when in season, the local produce is so fresh, often picked that morning and quite regularly organic or pesticide free. As chef of Le Chien Noir in downtown Kingston for just shy of 10 years and in restaurant kitchens for the past 20 years, there has been a change in this chef’s life. He joins Seed to Sausage as production manager and. most recently, he steps up to the plate at the Grilled Cheese Chowdown at The Great Canadian Cheese Festival on the Sunday of a two-day-long cheesy affair from June 4-5 at the Picton Fairgrounds. The challenge? To compete alongside thee chefs making grilled-cheese sandwiches for 1,000 cheese lovers as quickly and efficiently as possible. First 1,000 tickets holders admitted to #TGCCF on Sunday get to chow down on a free grilled-cheese sandwich. Chef Derek’s passion for food is still as strong as ever and he admits that his transition to Seed to Sausage was by need of change of scene as the pressure of running a line nightly was beginning to take a toll. A strong sense of loyalty and friendship with founder Michael McKenzie solidified his next move all while still continuing to work with good food. His love for food allows him to continue his journey and inspire others around him to come together. With the title of chef also comes a love of cheese—fond of goat and sheep’s milk cheeses, Derek has always impressed with this characuterie boards and dishes in the past. Of course picking one favourite Canadian cheese is quite the tough decision; his favourites include Grey Owl, Alegretto, and Seine d’Helene as well as a hometown cheese from Glengarry with its 4-year-old Lankaaster. Chef Derek will be quite the contender at this year’s Grilled Cheese Chowdown and a crowd favourite with his enthusiastic spirit. As a proud locavore, he certainly is a prime choice for the competition. Support Derek MacGregor this weekend June 4-5 at The Great Canadian Cheese Festival in Picton because, really, who doesn’t love grilled cheese? For complete information and tickets, please visit cheesefestival.ca. A food writer and photographer who calls Kingston home. She blogs about food, fashion and other good things life at www.rosalyngambhir.com.